This weekend I am reading a completely new book. I haven't read it or started it yet so I can't tell you anything about it other than it sounds amazing! It was written by a friend of mine and recently released. I will see if Ms. Hulsey would like to be on my Wednesday segment "Inside Book Studio" this week to discuss the book and do the Proust questions. So say tuned and check out her book. No one wants to know everyone’s darkest secrets, especially not police officer, Nicole Keenan. All she wants is a blissfully normal life in the small, Alabama town where she was born. But as generations of power running through her veins start to wake up, an ancient grudge is ignited that threatens to push her over the edge. She can hardly believe in what she is, let alone that a dark force will not stop until she's joins them. Or is dead. Nicole Keenan's life enters into a dangerous dance with warriors and gothic fairies. 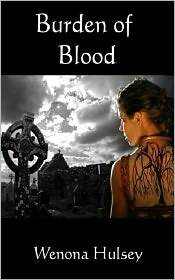 Southern tradition collides with Irish folklore as she learns about love, heartbreak, and The Burden of Blood.